The month of Christmas is here and stores are flooded with eager shoppers. For retailers who stock electronics, clothes, toys etc. this is the high season for making a larger profit on their AdWords campaigns. From hereon we’ll focus on this business sector and give an overview of the Christmas-shopping timeline. The first and foremost you can do to face the holidays – make sure your budgets and bids can handle the increase in traffic. You don’t want to miss out on conversion rates 3x higher than the normal due to limited budgets. Also, don’t wait too long – the Christmas delivery cut-off is approaching. There are always some peak days during November and December when the volume of traffic and the amount of purchases goes through the roof. A big bump in sales can be expected every year in the beginning of December. As the month changes, people are suddenly reminded of.. Oh, presents! The peak days to consider are the Monday before Christmas and the day before Christmas for offline store searches. 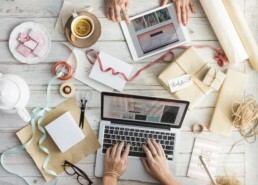 There is a general trend of people shopping on Mondays, presumably because they spend more time on their computers during workdays than on the weekends. The Monday before Christmas is one to look out for – shoppers can feel the time pressure, resulting in record breaking conversion rates. Don’t be surprised to see the conversion rates drop already a few days before the big day. Shoppers also take notice of the delivery lead times and when there aren’t enough days left, take their online research to a physical store. Therefore, be sure to add a location extension if you’re advertising your store in the Google search results. In addition to the general trends, it’s important to consider individual keywords, such as “gifts for her”, “gifts for ladies” or “gifts for old men”, for example. You can look up the peak days last year for your keywords in your AdWords account. If you don’t have the info on AdWords, check Google Trends to find out how, for example, men vs. women shop for their loved ones and which are the peak days in each gift category. Google Trends recently got a handy update, so you can filter out search results by selecting Web Search, Image Search, News Search, Youtube or Google Shopping. To better understand the Holiday shopping trends, we should consider how and where they have originated, and how they keep evolving over time. This way, we can catch the ongoing changes in consumer behaviour as they are unfolding in our target location. For example, Black Friday is the biggest shopping-holiday in the United States. 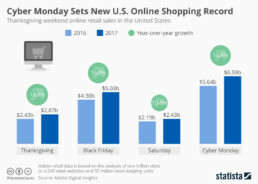 Because of this tradition, the peak of online sales in November usually comes on Cyber Monday – the Monday after the Thanksgiving holidays (November 27 in 2017). In some ways, the Holidays never end. It almost feels like there’s always something going on in some part of the world. For example, the Russian Christmas arrives on the 8th of January, so they will keep shopping right till the end of the year. The Brits also like to keep on shopping for a few days after Christmas. But be aware and prepared for the big drops after peak days. Be ready to lower your bids and budgets when the profitability suddenly decreases. 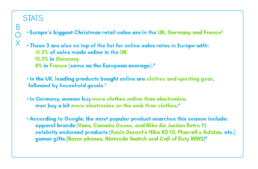 To compare the shopping habits in different locations, one resource to check is Google’s Consumer Barometer. There are plenty more statistics websites to go deeper into the trends. It’s useful to know which products are bought online the most and how much sales are made on mobile vs. desktop. Finally, go ahead and have a look in your AdWords account and analyse how your campaigns performed last year! When heading into December, it’s important to remember: with opportunity comes responsibility. If you take advantage of the increase in sales, you must be ready to meet the demand – have enough inventory and customer support staff ready for the extra enquiries. If you’ve done that, you’re all set. This article is a part of our Holiday advertising series. Read the first article here.